As I'm preparing to move homes very soon, I'm currently without broadband internet at home (this post is written through a 3G wireless connection). But here's the pitfall: How would you setup a so declared internet radio without a working internet connection? After all Logitech's first time wizard seems to require an internet connection, otherwise you'll be stuck with an error message. Because I'm using all my SqueezeBoxes with the SqueezeBox Server only, I'm not dependending on the internet connection. Luckily, there's a (undocumented) way to work around this. 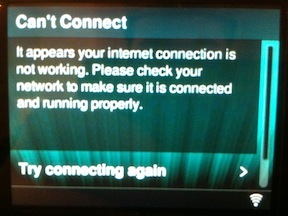 In my case this is absolute nonsense as I _KNOW_ that the local network is working, but it doesn't have an internet connection for now. So I want a way to get out of the stupid wizard. Tapping on the various buttons as well as turning off/on the device will not help in exiting the setup wizard. At last, just keeping the "BACK" button pressed for a few seconds will sound an acustic signal (multiple beeps) and drop you out to the main menu. And if you - as me - configured your WiFi settings, these will still be kept intact. You now can connect your local SqueezeBox media server from the "My Music" menu. Missing accomplished. I just wonder why this is not officially documented. Apparently the above procedure only applies to SqueezeBox Radio with older Firmware (7.4 series). 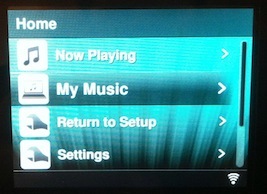 With newer firmware (7.5 series) you'll get an option to select a local SqueezeBox Server which will make a proper exit. After all, I had to take additional hurdles to get the new firmware onto my Squeezebox Radio.